Oh, The Flacks, The Obstacles They Throw Up…. A major shout-out to my co-blogger and co-author, Dave Cuillier, for this fantastic study…and thanks to the good folks at the Society of Environmental Journalists for the tip! We’ve all felt that the obstacles that government PIO “minders” throw up have been growing in number and intensity, and now a study by SPJ proves it…it is a fascinating look at the barriers reporters face in the form of government controls. See the full report, “Mediated Access: Journalists’ Perceptions Of Federal Public Information Officer Media Control,” Society of Professional Journalists, March 12, 2012, by Carolyn Carlson, David Cuillier, and Lindsey Tulkoff, here. Illinoisans would be allowed to make recordings of police officers in public under a bill that an Illinois House committee approved Wednesday. Existing state law allows the audiotaping of a person only if both parties to the conversation give their consent. Videotaping doesn’t require consent, but only if there is no audio with the video. Most states allow audio recording of conversations with one-party consent — when any participant in a conversation gives consent to record it. A handful of states require consent from both parties to the conversation. Illinois requires consent from all parties to the conversation. The Illinois law allows video recording with the sound turned off, as well as the audio recording of a distant event where the voices are not audible. The Illinois law also has an exemption for news broadcasts. But with the Internet and blogs and YouTube, the line between citizens and journalists is blurring. And footage from citizens’ cellphones often ends up on the websites and broadcasts of large news organizations. The Illinois Association of Chiefs of Police doesn’t necessarily oppose a change to let people record police activity, but it wants changes of their own, said the group’s lobbyist, Laimutis Nargelenas. A Las Vegas police officer detained a man for refusing to walk away after taking a photo of a movie set that was completely visible to the public. The man video recorded his interaction, which doesn’t show the officer’s face or name, but allows us to clearly hear him trying to justify giving the photographeran unlawful order. The photographer whose username is 1willwanders on Youtube, held his ground, asking the officer to cite him the law that would allow him to single out a person for taking photos on a public street, ordering him to walk away while countless other people are allowed to remain because they are not taking photos. The officer was unable to do so. The photographer was allowed to walk away after more than two minutes of debating with the cop. The Department of Health and Human Services last week released a media policywhich makes it official that staff members and reporters are forbidden to speak to each other without reporting to public information officers and supervisors. Although over the last 10-20 years HHS and many of its agencies have prohibited staff members not to speak to reporters without PIO oversight, this is apparently the first time in history the agency has put it in writing. This, folks, is ridiculous, and Foxhall is organizing a long-overdue pushback. Subscribe to her blog today and start fighting back. A New York police officer arrested a freelance photojournalist Friday after he attempted to film a police scene on a public street, outraging First Amendment and civil liberties advocates. The department has since said it plans to drop the charge. Suffolk County police charged cameraman Phil Datz, of the Long Island-based Stringer News Service, for “obstruction of governmental administration” after he filmed police on the side of the road arresting suspects who had allegedly led officers on a police chase in Bohemia. The interaction between Datz and the officer who arrested him was caught on tape andposted to YouTube. “You understand I’ve been doing this for 30 years, and there’s nothing you can hold over my head,” the officer said. The video then shows Datz returning to his car and moving more than a block away from the scene to continue filming. 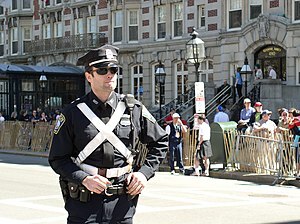 Members of the public, including children, were allowed to stand near the police scene. Once Datz was spotted further away, the police officer sped toward him in his patrol car. The video shows Datz quickly try to explain that he called the police department’s public information office, but before he can finish his sentence, the officer orders him to put his camera down and informs him that he is under arrest.